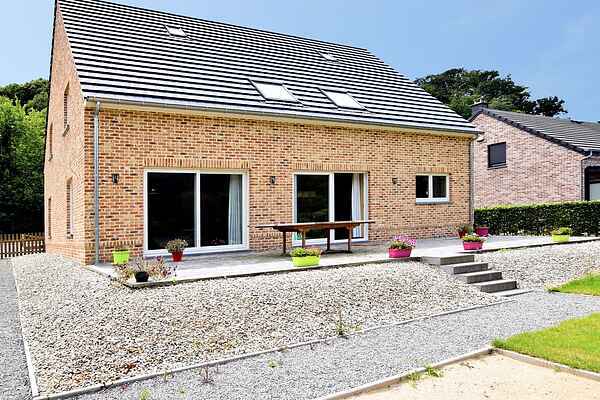 This holiday home in Hastière sits in the Belgian Ardennes. The interior is both cozy and modern. From the home, the garden, and the terrace, you have a beautiful view of the Maas river. Downstairs, you'll find a spacious living room with a charming seating area. There is also a large dining table for the whole group next to an open kitchen, fully-furnished with every type of amenities. A separate game room with foosball and a dart board is located beside the hall. The bedrooms are peacefully decorated and there are two full bathrooms on the premises. It's great to relax outside on the large terrace with barbecue or to play a game of petanque. The area around the home offers excellent opportunities for hiking, mountain biking, biking, kayaking, and cross-country skiing. You'll find the woods 1 kilometer away and the supermarket and other shops are located 1.5 kilometers from the home. There are indoor and outdoor swimming pools available approximately 10 kilometers from the house. A visit to the Saturday market in Hastière is also quite nice. A visit to Dinant (17 km) with its world-renowned Citadel is also not to be missed.